Novel tactic works a charm. 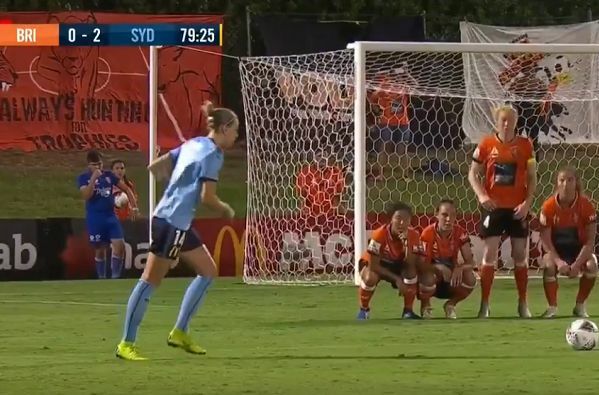 Brisbane Roar’s defensive wall bobbed up and down to distract a Sydney free kick taker during an Australian W-League semi-final match on Sunday. As Sydney’s Alanna Kennedy prepared to take a shot on goal with her side 2-0 up, Brisbane Roar defenders took it in turns to crouch down and spring up again. The tactic, which has been compared to the old whack-a-mole arcade game, seemed to work a charm as Kennedy went on to blaze high and wide. In a show of sporting behaviour, she then shares a high-five and even a smile with the opposition players who foiled her. Although Brisbane Roar went on to pull a goal back, the Sky Blues held on to win 2-1 at the Dolphin Oval and progress to next week’s W-League grand final.